Let me be clear. I am not an artist. From the beginning of this blog, I have not meant to portray myself as a good, much less great, cook. What I am is a person who likes puzzles and projects. That’s how I think of cookbooks and cooking magazines. The recipes in them present challenging puzzles to solve. Even the best cookbook writer’s recipes are not transparent. To a degree all instructions need interpretation. Interpreting interests me. But whenever I am in Europe, I am humbled. It’s not that the cooking and food is better than I can find in the States. I am humbled whenever I am caught without my cooking reference books, my own equipment, and ingredients that I know intimately. To put it succinctly, I never cook well when I am in Europe. In all the years I’ve been coming to Europe annually, I have never made a dish as well and as satisfying as I have at home. Until this morning, I have had my London friends, Ann and Jonathan and their two year-old Ava, to visit me here in the flat I rent in Bordeaux. The flat is spacious, comfortable, and situated right on the Garonne, which I see at this moment out the large windows. We decided to eat in during their visit. I was in charge of the dinner on Saturday. We bought fresh wild mushrooms — girolles — and fresh pasta at an Italian shop, créme fraiche, frissée lettuce and smoked bacon for a salad, and cheese to conclude the meal. The meal was a disaster. The frissée salad with bacon and fried egg did not please, although the smoked bacon was very tasty. The mushrooms had grit in them, the pasta was thick and made from some kind of flour that was totally unsuited to pasta, and the sea salt was too salty. Horrible. None of us could finish it. What a discouraging meal. On Sunday, we went to the marvelous open-air market along the river, where Jonathan and Ann bought two large duck breasts, watercress, baby zucchini, a light frothy ball of fresh chèvre, plums, a fat slice of terrine de foie gras, raspberries, and thyme-scented honey. Somewhere along the way, we sat at a small table and slurped down a dozen oysters. That night, Ann and I stayed out of the kitchen and Jonathan went to work. 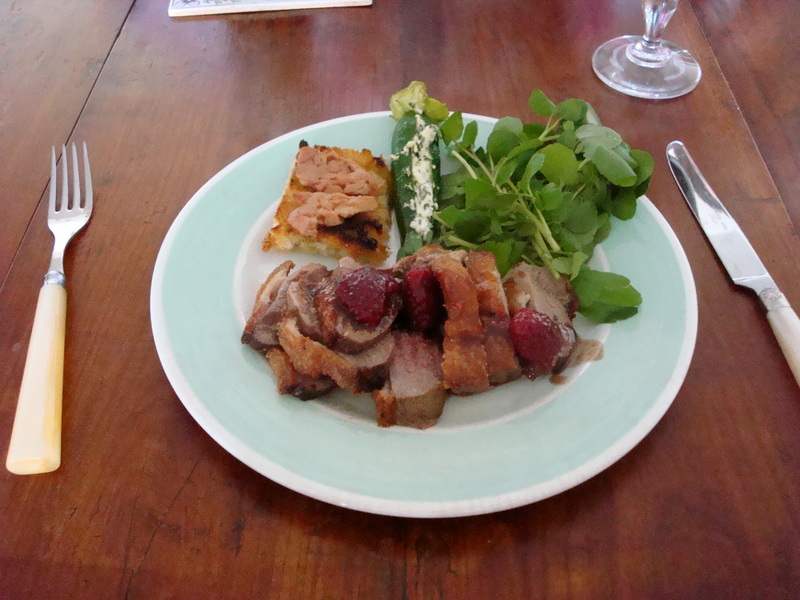 He produced pan-seared duck breasts with a sauce made of fresh raspberries and wine, roasted baby zucchini stuffed with a little chèvre, foie gras on little square toasts (to replace the potatoes that Ann and I were supposed to buy but didn’t because of a miscommunication). What a meal! Two-year old Ava did what the adults felt too constrained by propriety to do: she licked her plate. There is a lesson to be learned. I should wean myself from my cookbooks — a little.